$15/hour or $225 live-in rate. No contracts and rate lock guaranteed! Most home care companies provide you with a laundry list of services. We have a laundry list too, and we take it a step further by focusing on your wellness in everything we do. 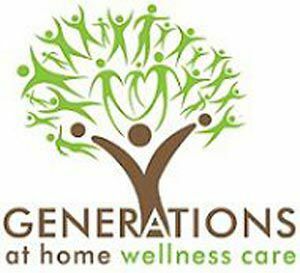 While Generations At Home Wellness Care utilizes a specific and detailed Wellness Plan unique to you, it’s not all about going through a checklist and completing tasks. For us, it’s about connecting with a positive and caring attitude, asking the right questions, building a strong relationship, and providing care specific to you. For you, it’s about peace of mind and feeling comfortable and content whatever your needs may be. Services: 24/7 Care, Errands / Appointment Reminders, Incontinent Care, Laundry Services, Alzheimer`s/Dementia/Parkinson`s Care, Light Exercise Program, Ambulatory Assistance, Doctor Appointments, Light Housekeeping, Live-In Care, Hygiene and Grooming Assistance, Meal Planning & Preparation, Cognitive Stimulation w/ cards & games, Medication Reminders, Companionship, Walking/Wheelchair Assistance, Nutrition, Respite Care for Family Caregivers, Physical Assistance & Homemaking, Personal Care & Hygiene and Wellness.